I'm building a compact computer to drive a powerful GPU. Many flagship video cards currently have two 8-pin PCIe power jacks (even though reference design nVIDIA 1080 Ti Founders Edition has 8+6 pins). My tiny SFX power supply, on the other hand, has only one 8-pin PCIe power socket with two others being, apparently, 6-pin PCIe power sockets. The manual of this PSU claims that it "supports dual PCI-E 8/6pin connectors". However, my power supply is quite powerful and is able to continuously deliver 50A on a 12V rail (600W), while the video cards require only about 250W. The question is, is it possible to power such 8+8 pins GPU with my 8+6+6 pins power supply delivering all the 250W it needs? And how to do it? UPDATE: Those two 6-pin sockets on my PSU turned out to be actually for powering IDE & SATA (that is hard drives and other peripherals). So there is only one PCIe power socket. An 6 pin connector (per spec) can deliver a max of 75 watts. This was by design when they started making cheap power supplies with cheap cables for safety purposes. An 8-pin connector has 2 extra ground wires that tells the graphics card that it can pull 150w over the 8pin instead of just 75w. If you used 2x6 pins, it would give the card 150w max. If you were to use one 8pin and one 6 pin, it would work, but the card would only pull 225w and possibly be a fire hazard. You can also buy a 6 to 8 pin adapter that adds 2 extra ground pins for a 150w pull. This can be risky if you have a cheap power supply. Personally, on such an expensive card, I would buy a new PSU for 50 or 60 bucks that has the appropriate connectors. If you want to take a risk, snag some 6pin to 8pin adapters off amazon. It turned out that my Silverstone PSU can drive 8+8-pin video card from the single 8-pin PCIe power socket. Geforce 1080 Ti works perfectly with it at up to 280W. 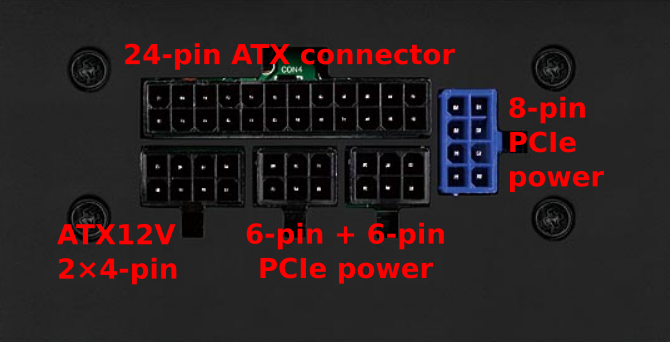 The PCIe power cable that came with my PSU had a single 8-pin connector on one side and two 6+2-pin connectors on another, so, basically, any video card with dual power connectors can be powered from it (either 6+6, 8+6 or 8+8-pin). Not the answer you're looking for? Browse other questions tagged graphics-card power-supply pci-express or ask your own question. What does a 1 x 6-Pin, 1 x 6+2-Pin look like? Powering 7970 HD cards. Separated cables or single cables? Is it possible to power a SATA drive from an 8-pin PCIe power connector? Will multiple 12v rails “stack” to power a GPU that needs more than each individual rail? How do I connect a video card which requires 6 pin PCIE, using a 8pin PCIE port on my PSU? Can I power two GPUs (2x 8pin, 1x 8pin) with two PSU cables?